Citation: Apuke OD, Tunca EA. Understanding the Implications of Social Media Usage in the Electoral Processes and Campaigns in Nigeria. Global Media Journal 2018, 16:31. Copyright: © 2018 Apuke OD, et al. This is an open-access article distributed under the terms of the Creative Commons Attribution License, which permits unrestricted use, distribution, and reproduction in any medium, provided the original author and source are credited. Social media such as Facebook, Twitter, and YouTube, as well as less popular sites, such as Google+ and Myspace, have been described as a tool that allows users to form a web-based profile that permits easy communication . Evidence has established that social media application has cut across diverse endeavours such as advertising, public relations, strategic communications and political communication [2,3]. In this regard, recent years have seen a growing body of knowledge demonstrating the connection between social media and electioneering campaigns and even political processes [4-6], suggesting that the prominence of social media, particularly in politics has the potential of positively influencing political participation . This connotes that the advent of social media has brought around a different type of political process and campaigns referred to as political digital campaigns which requires political candidates getting acquainted with social media strategy to connect with electorates so as to influence them and the society at large . Therefore, there is good evidence largely from existing studies to suggest that social media is now being used in political campaigns to circularize diverse campaign messages to various constituents who have an interest in the political career and aspirations of a candidate [5,9-12]. Indeed, there is a relationship between social media and politics [2,13] and through social media political mobilization and supports is attainable [14,15]. Interestingly, research has indicated that social media has turned into one of the fundamental platforms for political aspirants in Africa. Through social media, they propagate diverse campaign messages to their constituents who have an interest in their political career and aspirations . Therefore, it has been indicated that African political leaders have found the outstanding effectiveness of social web sites and use them for their political campaigns. In this regard, Okoro and Nwafor  reported that with social networking sites political aspirants appeal to citizens, and contact supporters and as such supporters contribute actively by commenting on various political aspirant agendas and anticipations. David et al. and Kreiss [6,14] commented that most political party and leader maintain an account on Facebook and Twitter in order to lay out their schedule. For instance, the utilization of social media sites such as Facebook, YouTube, Twitter, and Blogs were massively deployed in the 2015 Nigerian General elections, due to its participatory and creative nature, it turned into an utter and exceptional platform for political campaign organizers doing electioneering crusades and other ideological trumpeting exercises, as well as political contribution and mobilization among others. According to Oseni , starting from the point of the campaign, through voting to the collation of results and the subsequent proclamation of winners by the Independent National Electoral Commission (INEC), social media were formidable forces in maintaining the masses informed. This suggests a strong relationship between political activities and social media. Although studies have shown that social media are essential social forces that lubricate the engine room of democracy in Africa [5,17], and are no doubt, revolutionizing the process of political communication and expanding the frontiers of political participation . Yet, other research has shown that social media are sometimes used inappropriately by political aspirants and their supporters which affect the fairness in political campaigns and processes at large . Supporting this view, Suntai and Targema  remarked that although social media provides a medium to facilitate democracy in Nigeria, yet, in the build-up to the 2015 general elections, the platforms were deployed to perpetuate campaigns of calumny against candidates with opposing views, which almost divided the country into the extremes of the Muslim-North and Christian-South. This implies that electoral crises and squabbles between contestants have taken on new dimensions due to the influence of social media. The increased availability of smartphones has made electorates who are even in the grassroots to disseminate messages during electioneering campaigns, in turn, creating a new implication for democracy. Therefore, social media are now used in both pre-election and post-election exercises. Whilst these may develop new chances for political campaigns, mobilization, engagement, and participation, it could also create misinformation geared towards discrediting a political adversary. Put simply, social media could promote free and fair elections; all the same, there are rising fears that it could be used for propaganda and manipulating of the electoral process in Africa and Nigeria in specific. These manipulations could affect the credibility of social media and politicians; as well as contribute to misinformation within the society. This is not surprising as Oyenuga  indicated that in political campaigns, social networking sites can turn out to be an intense and deadly weapon in the hands of political candidates, in which various video releases, voice lines, feature reports, headlines, and broadcasts are made to tarnish other political candidates and individuals. The above views suggest that there have been an increasing number of considerable researches on the use of social media in political campaigns in Nigerian with mixed findings. In this regard, scholars have widely appreciated and critiqued the impact of social media on political processes and campaign in Nigeria. It is, therefore, worthwhile to put forward and corroborate literature on the implications of social media usage in electoral processes in Nigeria. Doing so will represent an important milestone in the development of research field as well as provide a scope for further investigation. This current study, therefore, seeks at drawing from the wealth of research experience to advance our understanding of how social media impact on elections, electioneering campaigns, and democracy in Nigeria. It demonstrates the collective intelligence of the eclectic body of research that uses various samples, participants, and methods. It thus unifies, corroborates and synthesizes streams of inquiry into a more coherent body of knowledge and provides an insight to the future investigations. Accordingly, the result of this work is beneficial for stakeholders, the public and future researchers in this field of inquiry. As set out in Figure 1, this study starts with an introduction and background to the study. Following, is the theoretical underpinning which is agenda settings and uses and gratifications. This will be followed by the general overview of social media impact on electoral processes and campaigns. The use of social media in political campaigns and elections in Nigeria will then be discussed, followed by the negative role social media has played in the Nigerian electoral processes. The chapter will then conclude with recommendations, proposition, and direction for future investigators. To provide a structure for this current study, the researcher locates this study within the Agenda and Uses and gratification theory. Evidence from a survey has shown that during electioneering campaigns, different social media outlets are utilized by politicians and electorate to propagate their views and opinions . Agenda setting depicts an intense impact of the media; the capacities disclose to us what issues are notable. It is “the process whereby the media lead the public in assigning relative importance to various public issues” . This means that the media is geared towards influencing people’s perception of what is necessary, acceptable and worthy. The media influence peoples to turn towards certain issues in the society neglecting another aspect; thus, striking issues are raised keeping in mind the end goal to impact the general population to think towards it. Additionally, Folarin  observes that “agenda setting suggests that the media predetermines what issues are regarded as important at a given time in a given society”. Relating this theory to the current subject field, it could be deduced that agenda setting explicates the role or functions of the media (social media) in ascertaining public agenda before, during and after elections. It further delineates the influence of social media in moulding and shaping the notion of the public towards some topical issues, of which election is paramount. Research has shown that political leaders have adopted social communication platforms such as Twitter and Facebook to propagate their agenda building campaigns , which in turn mould and shape the notion of the public towards their agenda and opinion. The Uses and Gratification theory was propounded by Katz, Blumler, and Gurevitch in 1974 . The theory advocates that people use certain media base on the gratification derived from it. Specifically, the uses and gratification theory directly place power in the hands of the users. Additionally, studies have described it as the gratifications or benefits that attract and hold audiences to diverse types of media and the types of content that satisfy their social and psychological demands [26,27]. Underpinning the concept of this theory to the current work, it could be deduced that politicians and their supporters use social media such as Facebook, Twitter, and YouTube to reach out to electorates in order to influence and induce voting behaviors. In recent decades, the potency of social media utilization and adoption, as well as its impact on political campaigns, has attracted an array of prior and recent studies . Although, studies have demonstrated that the traditional mass media still take on a significant role in the campaign ecology [29,30] because it is a platform for Television debates and advertising of press conferences . However, the emergence of social media, which is specified as “platforms for interaction and information exchange” , has introduced a new pathway for inducing political attitudes and participation and enhancing participatory communication, as well as faster dialoguing, and engagement . As the recent e-campaigning tool, social media such as Facebook, YouTube, and Twitter allow political aspirants to speak to voters at once in more personalized, responsive and dialogue manner, enhancing the connection between citizens and candidates . Put simply, it is a medium to bypass the conventional media and communicate directly with voters via websites and other social media sites such as Facebook and Twitter. Similarly, Rodrigues and Niemann  pointed out that the advent of social media has provided politicians across the globe a direct means of reaching and interacting with their potential supporters during election campaigns. Supporting this notion, a survey demonstrates that political aspirants and the electorate have signed up on various social media such as Facebook, and Twitter in order to build their online followings and support positive electoral outcomes as well as seek for donations. Satterfield  reiterated that there is a shift in the political landscape due to the potential of social media in political campaigns. Political aspirants and their supporters constantly post their views on Facebook and Twitter. It was disclosed that through social networking sites political candidates appeal to citizens by keeping regular contact with their supporters thereby inducing supporters’ contribution and likeness through active comments. This supports studies, which emphasized that most political parties and leaders maintained an account on Facebook, Twitter and other social network sites, where they place their agenda. Indeed, the use of web-based social networking systems, for instance, Facebook, Twitter and YouTube in the electioneering campaign can never be overemphasized . For example, social media such as Facebook allow users to partake in their political beliefs, support a specific candidate and interact with others on political issues [1,9,13,14]. Specifically, evidence has indicated that a notable use of Facebook was during Obama's 2008 political campaigns. This was efficiently used to contact the group of the electorate, notably the young (Figure 2). Figure 2: Obama 2008 Facebook campaign page. According to Smith , through Facebook, Myspace, and Twitter, Obama was able to build relationships with his supporters which enabled him to win the 2008 elections. This is consistent with Heinemann and Halperin who highlighted that Obama’s adoption and utilization of social media in his campaign was a clear shift from the conventional internet election. There was an overall branding strategy of him as the head of a movement for change in US politics. Harfoush  also found that Obama’s core campaign message was essentially about “what we can perform together... your time, your vitality, and your advice.” This conforms with evidence which hints that the campaign centered on the mobilisation of activists, encouraged participation by offering feedback to the electorates resulting in a positive support . Similarly, Harfoush observed that the Obama online campaign did reach new supporters, and promoted wider participation. Some other notable social media that have acquired significance in political campaigns is the Twitter, which sustains more than 328 million monthly active users across the world . Twitter, allows users to post and read statements, thoughts, and links in 140 characters known as tweets. This has made it a user-friendly tool for politics and political campaigns . According to Levy , more than a billion tweets related to the election were posted during the 2015–16 U.S presidential campaign (Figure 3). 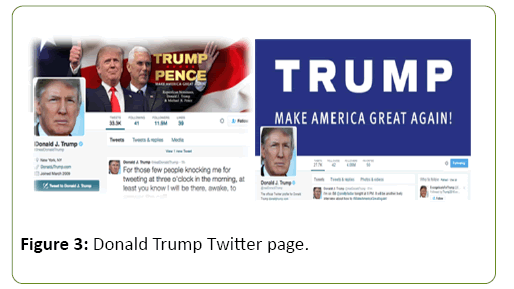 Figure 3: Donald Trump Twitter page. Similarly, Alfred  found that social media as demonstrated in Figure 3, was the greatest assets of Donald Trump; he made extensive and adequate use of it to reach the masses which eventually made him the winner of the 2016 presidential election. Expanding on this observation, Sophia  observed that during the United States campaign, Trump had outgunned all other prospects with his usage of the social media as a tool to speak straight to his voters, to portray his own personality in extreme detail and to wage Twitter wars against his rivals. This proves the effectiveness of the utilization of social media in political efforts which has revamped and changed politics. Indeed, research has demonstrated that campaigning through social media such as Facebook and Twitter place more emphasis on the individual politician rather than the political party, resulting to increased personalized campaigning and interaction with the electorate and supporters . Moreover, most political online campaign adopts the online relationship cultivation strategies that require the disclosure or openness, data dissemination, interactivity and involvement . Having understood the general usage of social media in political campaigns as well as in a developed nation such as the US, it is worthwhile to explore the Nigerian experience, since there is a continuous evidence to show that in the African context social media is now being utilized for political processes. In prospect of this, the next part will explore the role of social media in political movements and elections in Nigeria. Recent years have seen a growth in the use of social media in political campaigns and electioneering processes in Nigeria. For instance, in the Nigerian 2015 general elections, Facebook was employed due to its participatory nature. It was used as a platform for political campaign organization, electioneering crusades, ideological trumpeting exercises, and mobilization of voters. This means that Facebook adoption in political campaigns helps political aspirants to disseminate information easily as well as mobilize voters. Supporting this view, an investigation that examined the Nigerian 2015 general elections also reported that Twitter was mostly used and this mobilized and influenced people to vote a particular candidate . This shows that the use of Twitter for political campaigns assist political aspirants in mobilizing and influencing the electorate to vote for them. This supports Suntai and Targema  who found that the civil society deployed the arsenal of social media effectively to broadcast information during the 2015 general elections in Nigeria. Accordingly, there was evidence to show that during the period of the campaign, Tweet meets and Hangouts were the in-thing within Nigerian online socio-political networks. Hashtags, such as #MeetGej, #Febuhari, #Marchoutjonathan, #WhyiwillvoteGEJ, #MarchforBuhari, #GMB15, #LagosForYou and #iHavedecided were promoted by politicians and their friends; while #NigeriaDecides, #Nigeria2015, #iPledgeToVote, #MyPVCnow, #GoVote, #VoteNoFight, etc., were promoted by civil society groups to increase citizens’ involvement . Even during the voting process, it was discovered that pictures and videos floated on Facebook and WhatsApp accounts showing party agents who were arrested in the act buying voters with money and some other concessions as well as the issue of underage voting in some states prompting immediate action by INEC. In the same way, Oseni  reiterated that during the collation of results, citizen journalists and the civil society used social media to inform the public as regards the results in several states across the country. This proposes that social media could be viewed as a watchdog and a reportage route to political processes in Nigeria. This view is harmony with Oyenuga  who found that in the 2015 presidential elections, social media results were sourced from wards and participating youth corps members in the electoral procedures even before the final release of INEC results. The release of the results via social media increased political participation as most people had firsthand results, before the final release. These results were not just transmitted from the social media blogs, but were also recirculated via social networking sites and applications. As a consequence, the process added value to the Nigerian political culture and facilitated other issues that might have resulted from the electoral operation. This evidence corroborates with Udoka  who commented that the 2015 election was decided, dominated and directed by social media because social media played a central role as a watchdog. As votes were still being counted at the polling units, the outcomes were immediately reported on various social media within minutes and when announced officially, the results were the same. Similarly, Temitope and Ahmad  observed that social media was utilized in the 2015 elections as an avenue for encouraging people to vote, collation and preservation of the election results which prevented possibly election manipulation that usually occurs in Nigeria. Some other related study by Okolo et al. clearly showed that there is a significant positive relationship between the usage of Facebook as an awareness, social media tool and projection of a political candidates’ image, suggesting that social media serve as credible tools and are capable of influencing the image of political candidates in Nigeria. This proposes that political candidates should carefully plan and execute communication strategies using various social media tools, so as to fully enjoy the inherent benefits of the social media tools such as credibility and awareness. Consistent with this notion, Emetumah  concludes that the role of social media in the Nigerian 2015 elections is inevitable because it was deployed to shape the opinions of many youths, increasing their political awareness and consciousness, which in turn resulted in an unbelievable presidential win of the opposition party (APC) over the ruling party (PDP). Contrary to this notion, other researchers believe that during the 2015 general elections, social media did not provide the platforms that were essential to the success of democratic struggles for political change or transformation of the political economy of voting in Nigeria, and that the extent to which they influenced choice of the candidate was minimal, even though they contributed to the choice of candidates [54,55]. This supports the survey of Edegoh and Anunike  which suggests that two leading political parties in the 2015 Nigerian general elections did not use social media much in the electioneering campaigns, but mainly for announcement of party flag bearers, accusations and counter accusations of electoral fraud posed by other opposition parties. The same study found that other opposition parties sparingly used social media in political campaigns. This means that there was a minimal usage of social media for electioneering campaigns in the 2015 Nigerian elections. Consequently, all registered political parties in Nigeria need to be more proactive users of social media in electioneering campaigns and processes at large. Nevertheless, the richness and power of social media in enhancing democracy is inevitable. Consistent with these findings, Dare  found that former Nigerian President Goodluck Jonathan launched his Facebook fan page to reach out to the youth and Nigerians with a view to getting feedback on electoral reform and other national issues. It is significant to mention that the purpose of social media was not only felt in the 2015 election but even in the 2011 elections. For example, Abubakar  who examined the place of social media in enhancing citizens, political participation in Nigeria, during the 2011 presidential electioneering, found that the political sphere, with the help of social media, broadened and allowed more people to participate in the political discourse that seems to be dominated by conventional media. Social media such as Facebook provided politicians and citizens a platform to share their views that influence the voters’ decision, policy initiation, and implementation. This is in harmony with Smyth and Best  who found that in the 2011 Nigerian general elections, social media helped to overcome the previous scarcity of information witnessed during electoral processes, and this lead to an increased transparency and reduction of tension. Thus, by providing sufficient civil society coordination, social media could be an efficient tool for electoral scrutiny, which in turn build public confidence. From the foregoing, it is clear that there is a plethora of works on social media, political communication, and democracy in Nigeria and a considerable number of these works indicates that social media usage has an impact on electioneering campaigns. Nevertheless, if used negatively it tarnishes the image of political aspirants and opponents leading to high level of propaganda. This view will be expanded upon in the next segment of this research, which describes the propaganda in e-electioneering campaigning in Nigeria. There is a research assertion which suggests that since social media pass information freely because they not unregulated, it is possible that many of the information is not subject to scrutiny and may be conjured, misrepresentation, or even misinformation. This notion has attracted studies to research into the political propaganda techniques found on social media during electioneering campaigns and process across Nigeria. For example, Akubor  reported that the Nigerian 2015 general elections, was characterised by character assassination, violence and abuses (hate) speeches on social media. Similarly, Emetumah  reported that in the presidential electioneering campaign, the All Progressive Congress (APC) and Peoples Democratic Party (PDP) which is the most notable political party in Nigeria accused themselves of spreading false information on social media using their followers, the platform became a new ground for propagating unreliable election messages. Another study concluded that in the 2015 general election, social media became a more potent tool and even a more lethal weapon and this resulted in releases in the form of videos, voice notes, headlines, as well as broadcasts that made and mar many political parties and individuals. A noteworthy incident was a publication on Senator Buruji Kashamu which almost marred his political dream and eventually his swearing in. There were also hate videos on both General Muhammadu Buhari and Senator Bola Tinubu which had the tendency of ending the political ambitions of these individuals. Apuke and Apollos  as well found that there were dysfunctions in the Facebook pages of the 2015 political aspirants in Nigeria, such as deliberate distortions in the information about opponents, abusive words, distortion of the facts about personal performance, and misinformation as a strategy for influencing electorate. This is consistent with prior studies which remarked that the new media is being used to malign, intimidate and discredit political opponents through comments and posts, resulting in a high level of misinformation which triggers conflicts [61,62]. In a similar study, Ibrahim, Pate, Pereira, Ya’u, Agbanyin, and Bagu  found that in the build-up to the 2015 election in Nigeria, there were enormous hate and dangerous speech, along with sentiments that lie latent in the minds of people expressed via social media. This implies that social media were employed to increase the divide between the North and the Southern part of the country, thereby creating an atmosphere full of enmity for one another. This situation posed a great threat to the fragile democracy which the country was striving to consolidate. In the same way, Olabamiji  who investigated the use and misuse of the new media for political communication in Nigeria’s 4th Republic revealed that although the new media like Facebook have enhanced political awareness and interaction, however, they are also being used in Nigeria to malign, intimidate and discredit political opponents thus triggering conflicts. In recapitulating the role of social media in political processes, Suntai and Targema  contend that although social media presents a useful tool in the hands of activists and concerned citizens to participate electorally as well as effectively play a watchdog role, a privilege which was not initially obtainable. However, there is the prevalence of hate and dangerous speech, increased intensity of lies, mischiefs, falsehood and negative propaganda, and the use of comment sections to attack, verbally assault, bully and demonise codiscussants, political aspirants and electorates. In summary, the intention of this research was to shed light on the implications, uses, and role of social media in the Nigerian electioneering campaigns and political processes at large. It, therefore, increases our understanding of how social media impact elections and democracy in Nigeria. It was deduced that in the Nigerian 2015 and 2011 general elections, social media was used due to its participatory nature. It was used as a platform for political campaign organization, electioneering crusades, ideological trumpeting exercises, and mobilization of voters. Thus, the civil society deployed the arsenal of social media effectively to distribute information. For example, in the 2015 elections, there was evidence to show that during the period of the campaign, Tweet meets and Hangouts were the in-thing within Nigerian online sociopolitical networks. During the collation of results, citizen journalists and the civil society used social media to inform the public as regards the results in several states across the country. This validated social media role as watchdog and a reportage route for political processes in Nigeria, thereby adding value to the political culture. Therefore, the role of social media in the Nigerian 2015 elections is inevitable because it was employed to shape the opinions of many youths, increasing their political awareness and consciousness, which in turn resulted in an unbelievable presidential win of the opposition party (APC) over the ruling party (PDP). Contrary to this view, it was also found that the potency of social media in the political campaign processes and the election was not appreciated by some scholars. They argue that during the 2015 general elections, social media did not provide the platforms that were essential to the success of democratic struggles for political change or transformation of the political economy of voting in Nigeria, and that the extent to which they influenced the choice of the candidate was minimal, even though they contributed to the choice of candidates. This indicates that the two leading political parties in the 2015 Nigerian general elections did not employ social media much in the electioneering campaigns, but primarily for the announcement of party flag bearers, accusations, and counter charges of electoral fraud posed by other opposition parties. Consequently, all registered political parties in Nigeria are encouraged to be more proactive users of social media in electioneering campaigns and processes at large. It was also discovered that social media were used in Nigeria as a weapon to undermine and even destroy the image of other political parties, especially the People’s Democratic Party and All Progressive Party. This means that although the role social media played was vital, yet, the Nigerian 2015 general elections, was characterised by character assassination, violence and abuses (hate) speeches on social media. For example, the All Progressive Congress (APC) and Peoples Democratic Party (PDP) which is the most notable political party in Nigeria accused themselves of spreading false information on social media using their followers, the platform became a new ground for propagating unreliable election messages. Social media became a more potent tool and even a more lethal weapon and this resulted in releases in the form of videos, voice notes, headlines, as well as broadcasts that made and mar many political parties and individuals. In addition, deliberate distortions in the information about opponents, abusive speech, distortion of the facts about personal performance, and misinformation as a strategy for influencing the electorate was also achieved through social media. This further increased the divide between the North and the southern part of the country, thereby creating an atmosphere full of enmity for one another. It could, thus, be inferred that social media usage has an impact on electioneering campaigns in Nigeria and beyond. Nevertheless, if used negatively it tarnishes the image of political aspirants and opponents leading to high level of propaganda. Thus, political messages should be founded on truth and full of information that will enable the electorate to gain a proper decision that will aid in getting the good people into governance. Conclusively, it could be deduced that this study has elucidated the role of social media in the Nigerian electioneering processes, future researchers are encouraged to explore more in further research. For instance, there was no study found to have examined computational propaganda in electioneering campaigns in Nigeria. This calls for future investigators to see into such area. Doing so will increase the understanding of political manipulation and propaganda in the electioneering process in Nigeria. Boulianne S (2015) Social media use and participation: A meta-analysis of current research. Information. Communication and Society 18: 524-538. Kaplan AM, Haenlein M (2010) Users of the world, unite! The challenges and opportunities of Social Media. Business horizons 53: 59-68. Sweetser KD, Lariscy RW (2008) Candidates make good friends: An analysis of candidates' uses of Facebook. International Journal of Strategic Communication 2: 175-198. Fountaine S (2017) What’s not to Like? : A Qualitative Study of Young Women Politicians’ Self-Framing on Twitter. Journal of Public Relations Research, pp: 1-19. 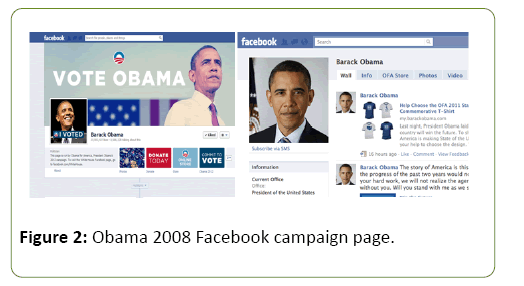 Borah P (2016) Political Facebook use: Campaign strategies used in 2008 and 2012 presidential elections. Journal of Information Technology & Politics 13: 326-338. David E, Zhitomirsky-Geffet M, Koppel M, Uzan H (2016). Utilizing Facebook pages of the political parties to automatically predict the political orientation of Facebook users. Online Information Review 40: 610-623. Stieglitz S, Dang-Xuan L (2013) Social media and political communication: a social media analytics framework. Social Network Analysis and Mining 3: 1277-1291. Khang H, Ki EJ, Ye L (2012) Social media research in advertising, communication, marketing, and public relations, 1997–2010. Journalism & Mass Communication Quarterly 89: 279-298. Okoro N, Nwafor KA (2013) Social media and political participation in Nigeria during the 2011 general elections: The lapses and the lessons. Global Journal of Arts, Humanities and Social Sciences 1: 29-46. Williams CB, Gulati GJJ (2013) Social networks in political campaigns: Facebook and the congressional elections of 2006 and 2008. New Media and Society 15: 52-71. Grow G, Ward J (2013) The role of authenticity in electoral social media campaigns. First Monday. Kim Y (2011) The contribution of social network sites to exposure to political difference: The relationships among SNSs, online political messaging, and exposure to cross-cutting perspectives. Computers in Human Behaviour 27: 971-977. Abbott J, MacDonald AW, Givens JW (2013) New Social Media and (Electronic) Democratization in East and Southeast Asia, Malaysia and China Compared. Taiwan Journal of Democracy. Chinedu-Okeke CF, Obi I (2016) Social Media as a Political Platform in Nigeria: A Focus on Electorates in South-Eastern Nigeria. Journal of Humanities and Social Science 21: 06-22. Kreiss D (2016) Seizing the moment: The presidential campaigns’ use of Twitter during the 2012 electoral cycle. New Media and Society 18: 1473-1490. Oseni AL (2015) How social media revolutionized election in Nigeria. Nagourney A (2008). The’08 campaign: Sea change for politics as we know it. The New York Times, 1. Suntai DI, Targema TS (2017). New media and democracy in Nigeria: an appraisal of the opportunities and threats in the terrain. Brazilian Journal 2: 198-209. Apuke OD, Iyendo TO (2017) The impact of internet usage on academic research and development – Students' Perspective in a Nigerian University. Journal of Humanities and Social Sciences: African Scholar Publications and Research International 6: 228-248. Oyenuga AS (2015) Social Media Participation and Pollution of the 2015 General Elections in Nigeria. Apuke OD, Apollos IN (2017) Public perception of the role of Facebook usage in political campaigns in Nigeria. Informing Science: International Journal of Community Development & Management Studies 1: 85-102. Zhu JH, Blood D (1997) Media agenda-setting theory: Telling the public what to think about. Emerging theories of human communication, pp: 88-114. Folarin B (1998) Theories of mass communication: An introductory text. Ibadan: Stirling-Horden Publishers. Chadwick A (2017) The hybrid media system: Politics and power. Oxford University Press. Wimmer RD, Dominick JR (2011) Mass media research: An introduction. Canada: Wadsworth. Apuke OD (2016) The influence of social media on academic performance of undergraduate students of Taraba state university, Jalingo, Nigeria. Research on Humanities and Social Science 6: 63-72. Wong WKW (2012) Faces on Facebook: A study of self-presentation and social support on Facebook. Run Run Shaw Library, City University of Hong Kong. Conway BA, Kenski K, Wang D (2015) The rise of Twitter in the political campaign: Searching for intermedia agenda‐setting effects in the presidential primary. Journal of Computer‐Mediated Communication 20: 363-380. Neyazi TA, Kumar A, Semetko HA (2016) Campaigns, digital media, and mobilization in India. The International Journal of Press/Politics 21: 398-416. Enli G (2017) Twitter as an arena for the authentic outsider: exploring the social media campaigns of Trump and Clinton in the 2016 US presidential election. European Journal of Communication 32: 50-61. Himelboim I, Golan GJ, Moon BB, Suto RJ (2014) A social networks approach to public relations on Twitter: Social mediators and mediated public relations. Journal of Public Relations Research 26: 359-379. Ross K, Bürger T (2014) Face to face (book) Social media, political campaigning and the unbearable lightness of being there. Political Science 66: 46-62. Oelsner K, Heimrich L (2015) Social Media Use of German Politicians: Towards Dialogic Voter Relations? German Politics 24: 451-468. Rodrigues UM, Niemann M (2017) Social Media as a Platform for Incessant Political Communication: A Case Study of Modi’s “Clean India” Campaign. International Journal of Communication 11: 23. Satterfield H (2016) How Social Media Affects Politics. Ajayi AI, Adesote SA (2015) The New Social Media and Consolidation of Democracy in Nigeria: Uses, Potentials, and Challenges. Journal of Good Governance and Sustainable Development in Africa (JGGSDA). Smith A (2015) Obama's Campaign. Harfoush R (2009) Yes, We Did! An inside look at how social media built the Obama brand. New Riders. Lilleker DG, Jackson NA (2010) Towards a more participatory style of election campaigning: The impact of Web 2.0 on the UK 2010 general election. Policy & Internet 2: 69-98. Statista.com (2017) Statistics and facts about social media usage. Ahmed MA, Lodhi SA, Shahzad MN (2011) Political Brand: trusting a candidate in the age of mistrust. Journal of Business and Retail Management Research 5: 131-141. Levy G (2016) Twitter Wins Big in 2016 Campaign. Alfred NG (2016) Donald Trump’s social media would doom him in a job interview. Sophia Z (2016) Dangers of governing by social media. Enli GS, Skogerbø E (2013) Personalized campaigns in party-centred politics: Twitter and Facebook as arenas for political communication. Information, Communication & Society 16: 757-774. Bartlett J, Krasodomski-Jones A, Daniel N, Fisher A, Jesperson S (2015) Social media for election communication and monitoring in Nigeria. A report prepared for the Department for International Development (DFID). Suntai DI, Targema TS (2015) Social media and democracy in Africa: assessing the 2015 general election experience in Nigeria. Paper presented at the International Conference on Democracy, Dictatorship and Development in Africa. Department of History and International Studies. Ibrahim Badamasi Babangida University, Lappi. Udoka UE (2015) Social Media and Political Effects: A Case Study of the 2015 Nigeria’s Presidential Election’. International Journal of Social Science and Humanities Research. Temitope OAS, Ahmad R (2017) The Role of Social Media During the 2015 Voting Process in the Nigeria Election. Research Journal of Applied Sciences 12: 281-287. Okolo VO, Ugonna IA, Nebo GN, Obikeze C (2017) Effects of the social media in the marketing of political candidates in Nigeria. British Journal of Marketing Studies 5: 15-32. Emetumah FI (2016) Social Media as a Factor for Increased Frontiers of Democracy in Nigeria’s 2015 Presidential Election. British Journal of Education, Society & Behavioural Science 17: 1-9. Mustapha M (2017) The 2015 general elections in Nigeria: new media, party politics and the political economy of voting. Review of African Political Economy 44; 312-321. Asemah ES (2017) Use of social media in the 2015 presidential election in Nigeria. Mass Communicator: International Journal of Communication Studies 11: 4-11. Edegoh LO, Anunike OW (2016) Voters’ Assessment of Social Media Use for 2015 Electioneering Campaigns by the two Leading Political Parties in Nigeria. African Research Review 10: 18-40. Dare S (2011) The Rise of Citizen Journalism in Nigeria-A Case Study of Sahara Reporters. Reuters Institute Fellowship Paper pp: 1-74. 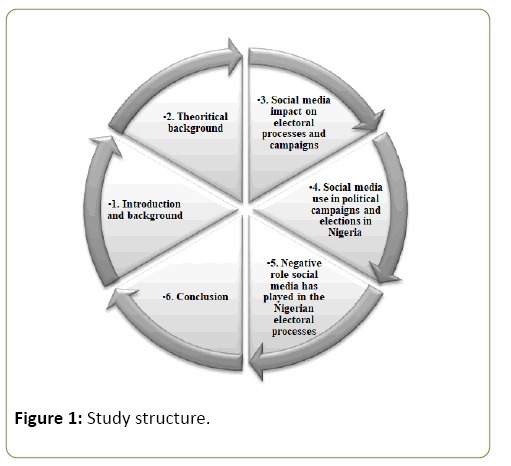 Abubakar A (2012) Political Participation and Discourse in Social Media during the 2011 Presidential electioneering. Journal of the African Council for Communication Education 10: 1. Smyth TN, Best ML (2013) Tweet to trust: social media and elections in West Africa. In Proceedings of the Sixth International Conference on Information and Communication Technologies and Development: Full Papers 1: 133-141. Akubor E (2015) Campaigns and Electioneering: Reflecting on the 2015 General Elections in Nigeria. A paper presented in a Two-Day National Conference on “the 2015 General Elections in Nigeria: The Real Issues”; Organized by the Electoral Institute, Abuja, Nigeria. Anggraini DA, Mustofa MHH, Sadewo YI (2014) Analysis of Political Campaigns through Facebook on Indonesian 2014 Presidential Election. Social Sciences 3: 1-9. Olabamiji O (2014) Use and Misuse of the New Media for Political Communication in Nigeria’s 4th Republic. Developing Country Studies 4: 44-53. Ibrahim I, Pate U, Pereira C, Ya’u YZ, Agbanyin BO, et al. (2017) The escalation of hate and dangerous speech in the buildup to the 2015 election and the imperative of strengthening the broadcasting code. A paper presented at the NBC Stakeholders Forum on Political Broadcasts, Chilla Luxury Suites, Kano.